This summer has been record-breakingly hot, and with everyone out and about enjoying the sun! As the late summer bank holiday draws nearer, BBQs are on full heat, beach bags are in constant use, and thoughts turn to the late summer bank holiday. 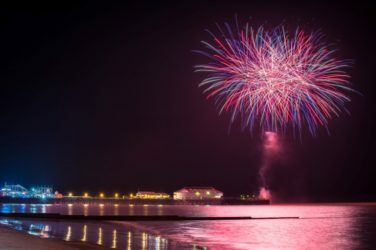 What better way to celebrate summer by finding a local event with fireworks? Summer is full of community fetes and regattas, find your local beach or pier to see what’s on! These events are never complete without fireworks, and whilst some of these displays may have a budget that reaches the thousands, the price of a professional display isn’t as much as you might think. Our teams with be busy with professional displays for late summer bank holiday fireworks 2018, lighting up the skies and faces of everyone around. Click here to see how you could complete your community event with a bespokely written display, or contact our friendly design team. with many Buy One Get One Free or Money Off there’s lots of bargains to e found. Small garden? Not to worry! Look out for smaller fireworks that have a safety distance of just 8 metres. Neighbours close by? Explore low noise options to keep everyone happy. Low effort: take a look at barrages which has everything you need for a display in one compact package. With the late summer bank holiday being one of the most poplar times to get married, it’s the perfect reason to complete your special day and celebrate in style! Wedding Packages are bespokely written and start from just £695! Get that perfect photo: the options here are endless! Capture your day in any way or style that suits you as a couple. First dance: Have you considered having your first dance outside, then surprise your guests with fireworks bursting high overhead part way through your song? This may seem like something dreams are made of, but dreams can come true, with a display designed and written to the beat and tempo of your song, making this moment magical and unforgettable! With fireworks having to be let off by 11pm, there’s plenty of time to leave with a bang: impress all your guests with a dazzling display to give your perfect day the perfect ending.